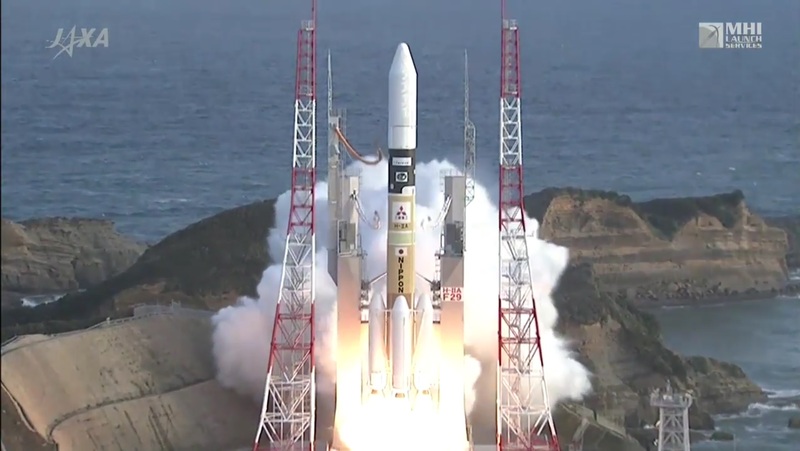 A Japanese H-IIA rocket made a thundering blastoff on Tuesday, embarking on Japan’s first commercial mission to Geostationary Transfer Orbit, carrying the Canadian-owned Telstar 12V satellite. 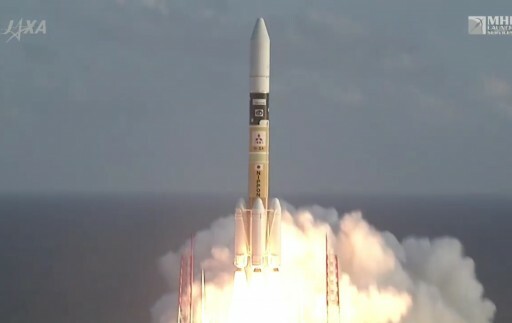 Lifting off from the picturesque Tanegashima Space Center at 6:50 UTC, H-IIA – flying in its most powerful 204 configuration – set sail on a long flight of four and a half hours, introducing a modified second stage that permits the launcher to support extended missions to high-energy orbits. 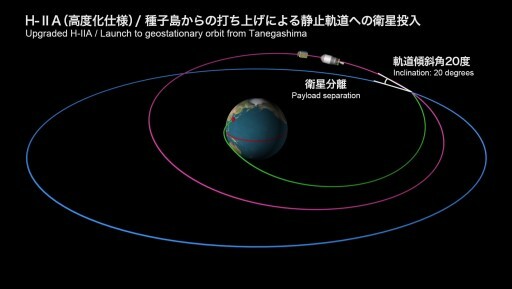 Spacecraft separation is expected to occur at 11:17 UTC. 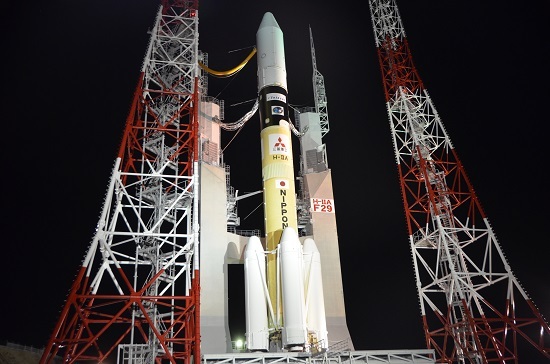 H-IIA was moved to the launch pad Monday afternoon UTC, in the late hours local time, for a lengthy overnight countdown. After completing its 30-minute trip from the Assembly Building to the launch pad, H-IIA was connected to ground systems and teams finished the final close outs on the launch facility and the rocket before evacuating the sea-side pad. H-IIA was powered up to undergo an extensive series of testing operations spanning several hours to ensure all systems were in readiness for flight. Tanking began eight hours prior to liftoff as the two stages of the H-IIA rocket were filled with supercold Liquid Oxygen and Liquid Hydrogen. It took about four hours for 120 metric tons to be loaded into the tanks of the rocket before fueling entered replenish until late in the countdown. 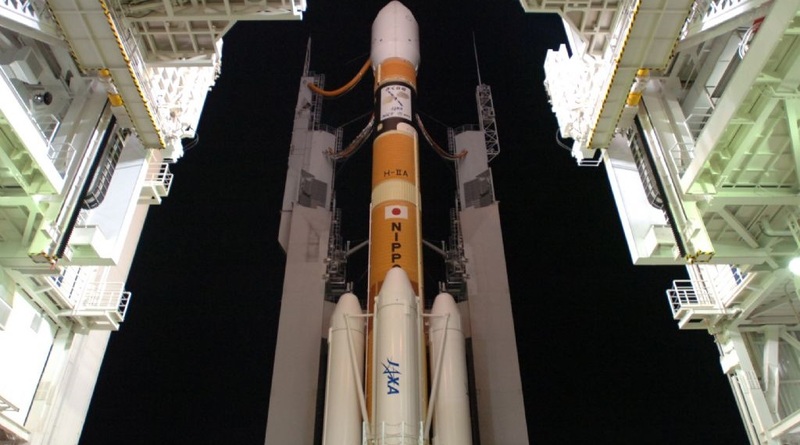 Teams continued systems checks until the final hour of the count started and H-IIA was transitioned to its launch configuration. The launch had to be delayed at the opening of the day’s long launch window due to a ship drifting into the restricted downrange launch corridor. Entering its terminal countdown after the range was cleared, H-IIA pressurized its tanks and transferred on onboard power and control. Lighting its powerful LE-7A engine at T-5 seconds, H-IIA built up thrust and monitored the engine before committing itself to flight by issuing the ignition command to its four boosters. Igniting the four SRB-A boosters, H-IIA jumped off its launch pad with a total thrust of 1,035 metric-ton-force, creating a thrust to weigh ratio greater than two. Flying in its 204 configuration for the second time, H-IIA made use of four boosters to deliver the additional kick needed to send Telstar 12V on its way to a Geostationary Transfer Orbit. Departing Tanegashima Island on the southernmost tip of Japan, H-IIA ascended vertically for only a few seconds before pitching and rolling onto its precisely planned course taking the rocket to the south east across the Pacific Ocean. The four boosters, each delivering 230,000 Kilogram-force of thrust, burned out one minute and 56 seconds into the flight and were jettisoned in pairs just after T+2 minutes at an altitude of 80 Kilometers. Powered by the core stage alone, H-IIA headed out of the atmosphere, making it safe to jettison the protective payload fairing three minutes and 25 seconds into the flight, revealing the Telstar 12V satellite for the rest of the way to orbit. Delivering 112,000 Kilogram-force of thrust, the LE-7A engine continued to burn until T+6 minutes and 40 seconds followed eight seconds later by stage separation to set the first stage up for re-entry and a crash landing in the Ocean. 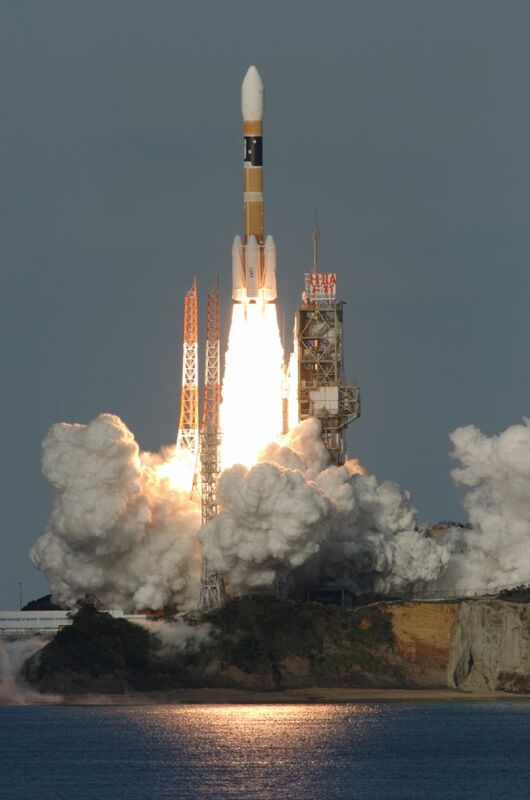 Six minutes and 54 seconds into the mission, H-IIA ignited its LE-5B engine on the second stage, soaring up to a thrust of 13,900 Kilogram-force to finish the job of boosting the stack into orbit. The engine fired just shy of four and a half minutes and successfully placed the stack into an elliptical Parking Orbit, but this was only the first step in a long mission to Geostationary Transfer Orbit. Concluding the first of three planned burns, H-IIA arrived in a preliminary orbit for a coast phase of just 11 minutes to allow the vehicle to proceed along its south-easterly ground track so that the second burn could be centering the equator passage in order to raise the apogee of the orbit and position it over the equator. The second burn begins at T+22:46 and has a planned duration of three minutes and 51 seconds to boost the vehicle’s velocity by 2.5 Kilometers per second. Cutoff on the second stage is expected at T+26:37. The stack will then enter the long coast phase needed to climb to the apogee of the orbit that is located slightly shy of Geostationary Altitude. To support this lengthy coast phase, a number of modifications were made to the second stage of the launch vehicle such as the use of a new thermal protection system to limit propellant boiloff, the modification of the engine chilldown system to consume less LOX, more powerful batteries and a modified propellant settling system using boiloff gases from the tanks. The coast phase will take the vehicle over the Pacific Ocean and South America for the final burn and spacecraft separation over Brazil. Throughout the coast, the vehicle will conduct a Passive Thermal Control maneuver to avoid thermal gradients from building up. Re-start of the LE-5B engine is expected four hours, 22 minutes and 45 seconds into the flight on a burn of only 46 seconds, raising the perigee of the orbit and reducing the inclination. 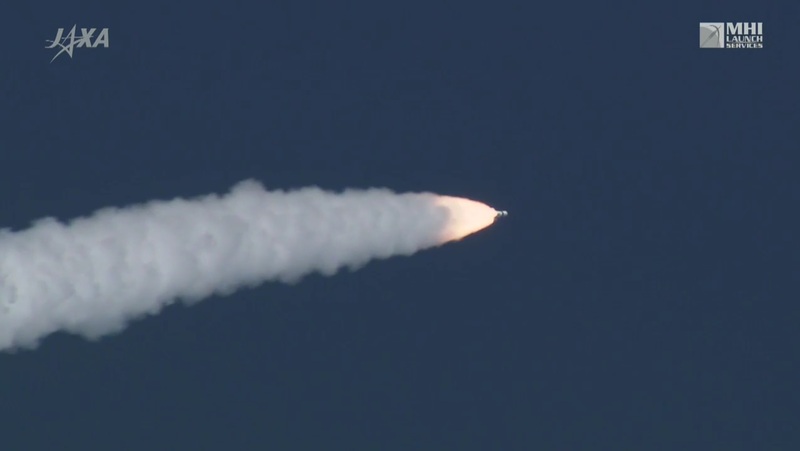 This burn makes use of a new 60% thrust setting on the LE-5B engine. Spacecraft separation is expected at T+4:26:56 at an altitude of 33,900 Kilometers. Telstar 12V aims for an insertion orbit of 2,700 by 36,585 Kilometers inclined 20.1 degrees. 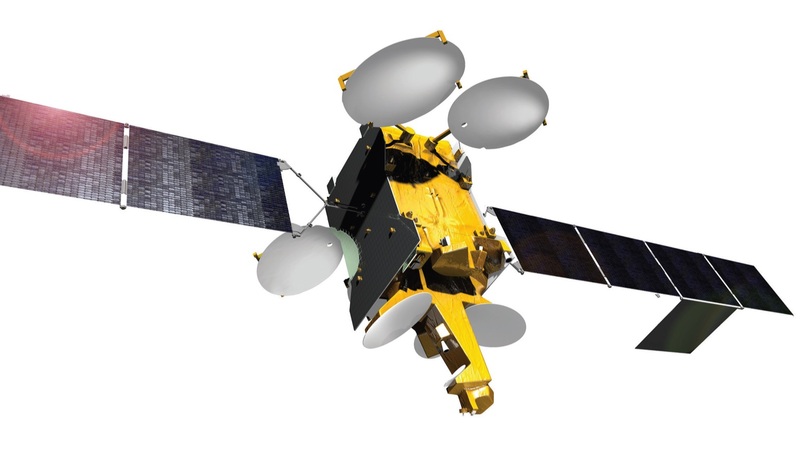 The 4,900-Kilogram Telstar 12 Vantage satellite, built by Airbus Defence and Space, is operated by Canadian communications provider Telesat. The satellite sports 52 Ku-Band transponders to deliver data services to the Americas, Europe, the Middle East and Africa. The combination of broad regional beams and more focused high-throughput spotbeams offers enhanced performance for broadband networks on the ground, in the air and at sea.